Bulls continue to enjoy the benefit of greater gains paired with smaller losses. Today was no exception. 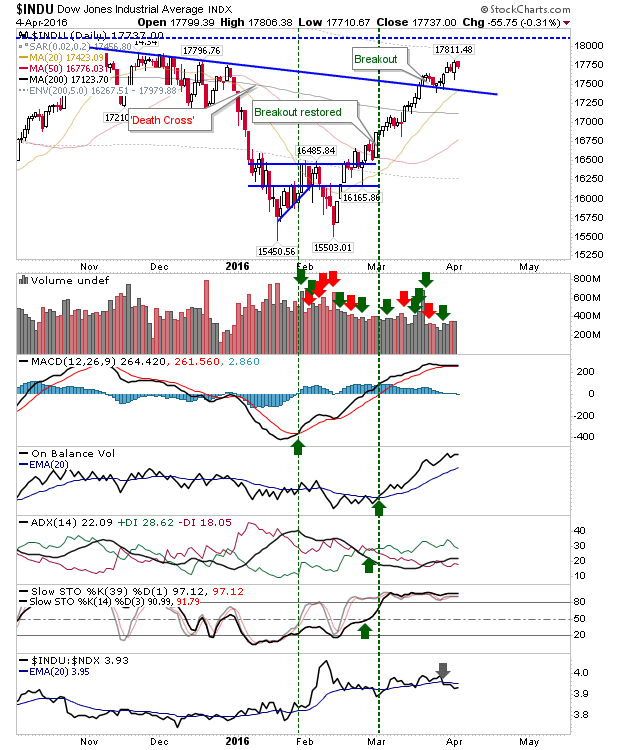 The S&P holds to last week's breakout with buying volume registering as accumulation as losses are returned on lighter volume. 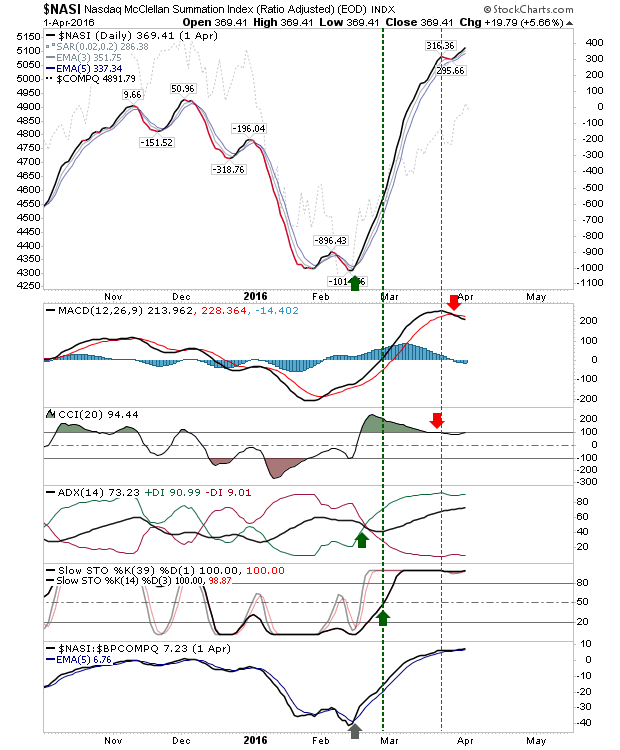 There is an upcoming 'sell' trigger in the MACD to watch and relative performance has moved away from Large Caps to Small Caps - which is better news for bulls in the long term. The Nasdaq is buffered against resistance but is clinging on to 200-day MA support. There is also net bullish technicals to work with. So far, this has been a healthy advance. The one fly in the ointment is the Nasdaq Summation Index. 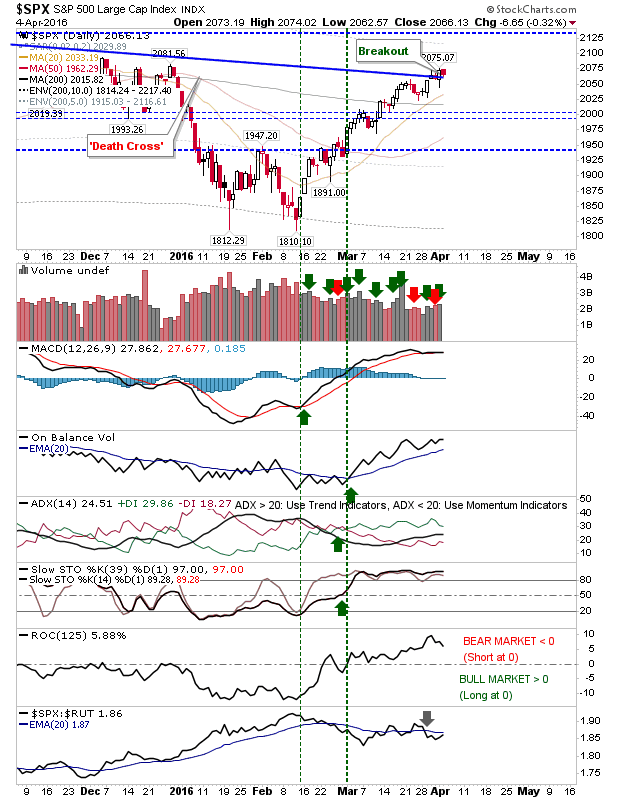 The underlying breadth metric continues to advance, but supporting technicals like the MACD and CCI have switched negative. 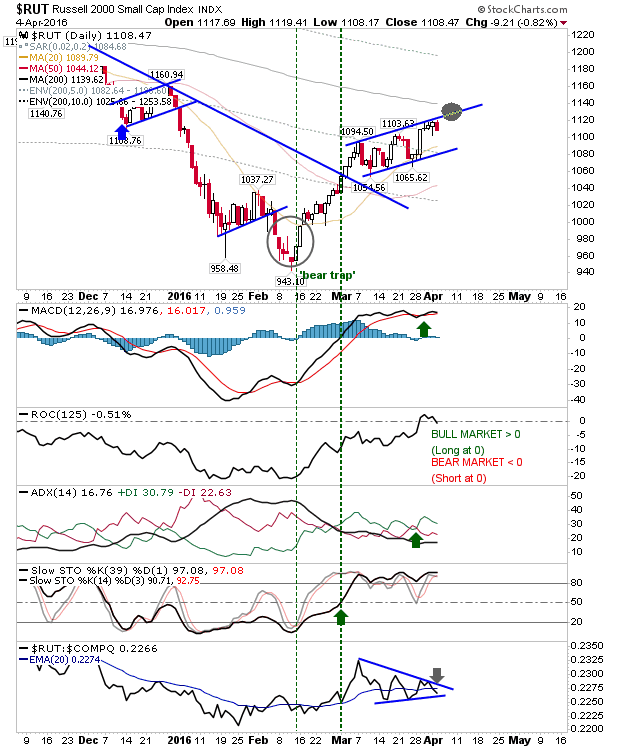 The Russell 2000 is showing a slowing advance with flattening technicals. The area to watch is the convergence of the 200-day MA with channel resistance (highlighted in grey). Relative performance against the Nasdaq is also zig-zagging into a triangle apex, with weakness holding the upper hand. Bulls should keep a close eye on the Dow as it fast approaches the stage where it could make new 52-week highs. It's deep inside the winter consolidation. 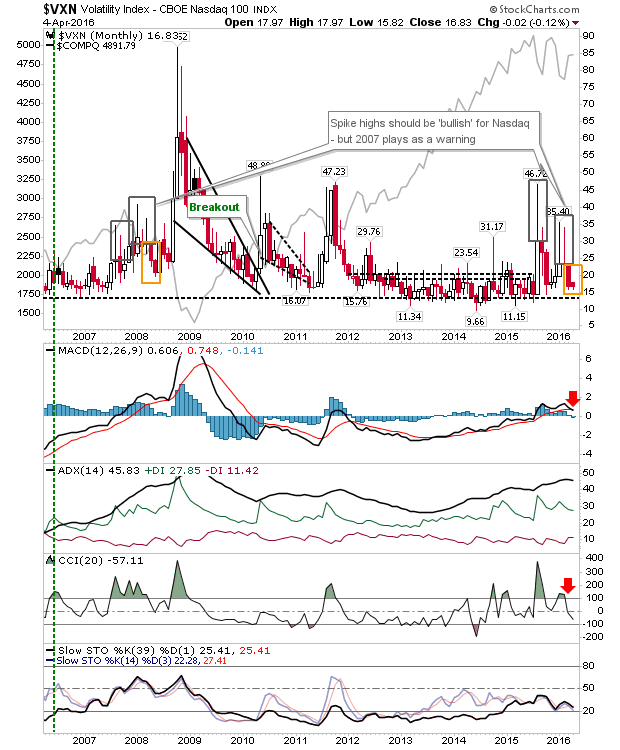 Bears should watch volatility. 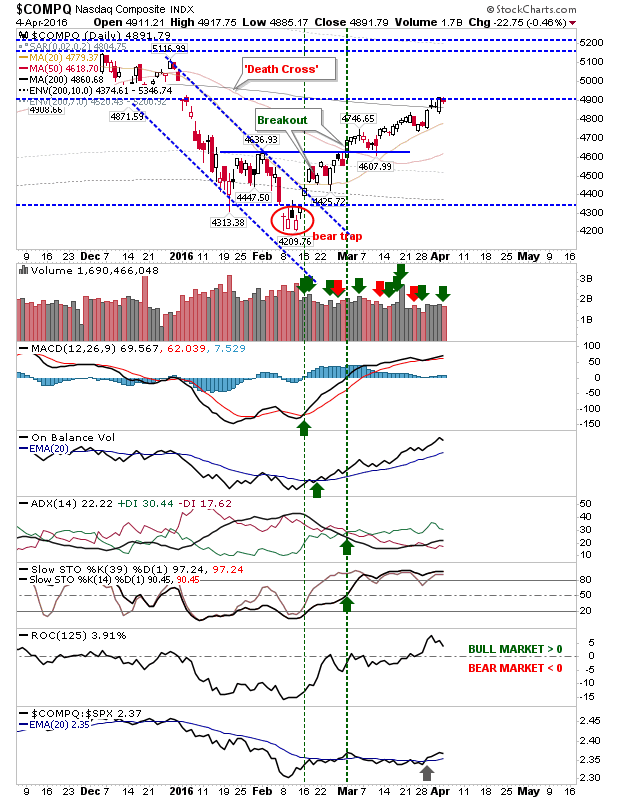 Spike highs have given bulls an easy time, but things are getting to a level where a surprise could catch bulls unawares. Keep an eye on the Dow and Nasdaq volatility.